Portfolio rebalancing is the investment strategy of periodically selling and re-buying assets in a portfolio to maintain a target asset allocation. Why do this? Because it reduces the tendency of a portfolio to drift and essentially readjusts a portfolio based on recent market trends and movements. Rebalancing is a core component of investment philosophy and can help improve risk-adjusted returns on a portfolio of assets, including on a cryptocurrency portfolio. As an emerging asset class, cryptocurrencies are extremely volatile and tend to have unpredictable price movements. By using a service like Shrimpy, users can automate their rebalancing strategy by simply configuring their asset allocation once and letting software do the rebalancing work. Let's assume that Carol is busy and chooses to hold her portfolio steady for investment purposes (no trades). The crypto markets move up and down during the year, resulting in the value of bitcoin increasing and ether decreasing, but the total portfolio value unchanged. If Carol were to have used Shrimpy's rebalancing feature during that year instead, they would have instead sold $250 worth of BTC automatically for ETH and brough the portfolio back to the original allocation. With rebalancing, Carol is able to automatically realize capital gains on profitable investments within the portfolio, and reinvest them into other assets that have not performed as well in comparison. In Carol’s case, Shrimpy was able to rebalance their BTC and ETH holdings to account for the market movements. Otherwise Carol would have been underexposed to ETH and overexposed to BTC compared to her ideal portfolio allocation. 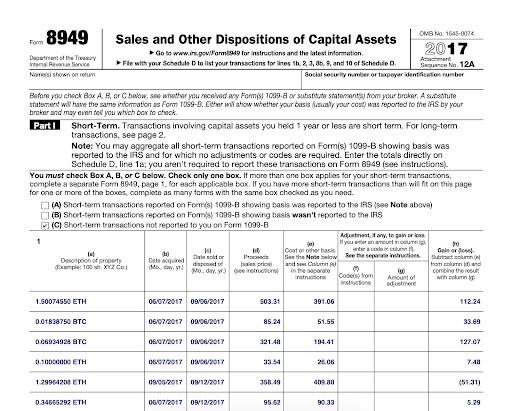 The Internal Revenue Service (IRS) has released guidance that selling or trading a cryptocurrency asset (including for another cryptocurrency asset) is a taxable event (more details). That means that rebalancing your cryptocurrency portfolio will lead to taxable events that you are responsible for reporting. 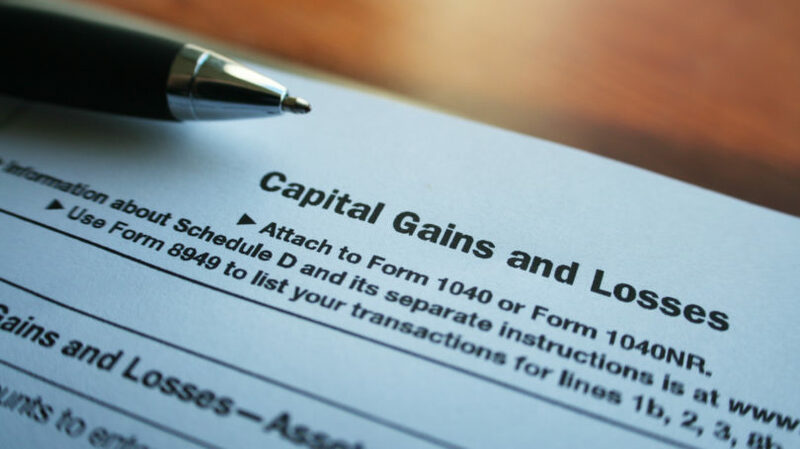 Make sure you aren’t stuck with unanticipated capital gains/losses that you don’t know about! This may seem like a headache, however there are services like CoinTracker which can help automate all of these calculations for you. CoinTracker automatically syncs all your transactions & balances across top cryptocurrency exchanges and local wallets. It then calculates your cost basis and capital gains across your whole portfolio as each transaction occurs, and outputs a completed IRS Form 8949 (capital gains form). For example in the case above, if Shrimpy facilitated rebalancing Carol’s portfolio, there would be a capital gain event that CoinTracker would automatically capture from your synced accounts and exchanges. Specifically, in this case $500 of BTC appreciated to $750 of BTC, and $250 (or one third of the total BTC) was sold for ETH. Therefore one third of the capital gain — or ⅓ * ($250) = $83.33 — was realized. If Carol were to instead rebalance weekly or even daily, instead of annually, CoinTracker would still capture all of those rebalance transactions and neatly incorporate them into the capital gains calculations. Even in years with huge capital losses (such as 2018), CoinTracker can help Carol claim capital losses. These can be used to offset capital gains in other asset classes, other types of income, or gains in future tax years. In many cases these can be to the tune of thousands of dollars or more in savings so see how you can get started. What are you waiting for? Get to rebalancing and tracking your cryptocurrency portfolio today! Have questions or comments? Let us know on Twitter @CoinTracker and @ShrimpyApp.